Manteo may seem like a typical North Carolina coastal town, but the area is as rich in attractions and fun as it is local history. The area is home to one of the world's greatest mysteries, the birthplace of English colonization in American, (literally), and a collection of Outer Banks attractions that have wowed vacationers for generations. A visit to Manteo, whether it's for a day or for a week, can be a veritable visit back in time with historical attractions like the Roanoke Island Festival Park, the Island Farm or the Elizabethan Gardens setting the scene of a bygone era. 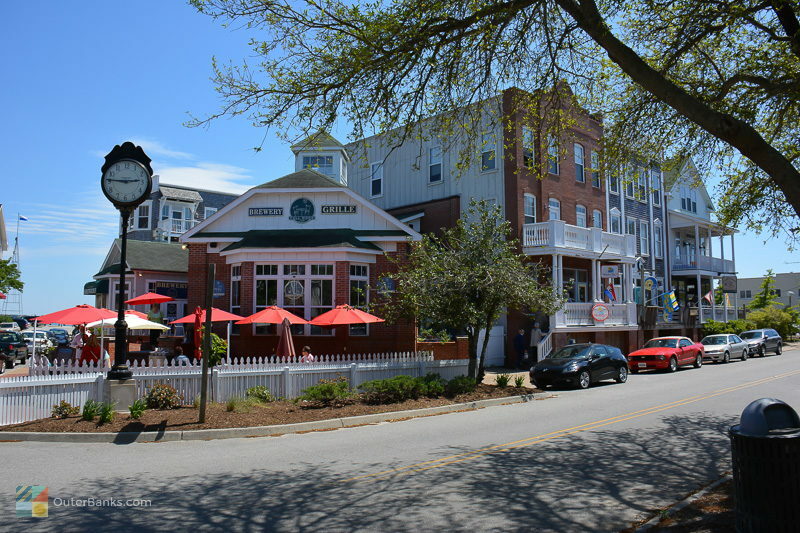 For vacationers more interested in modern fare, the downtown offers blocks of homegrown boutiques, book shops, gift stores, and some of the region's most celebrated restaurants, all located conveniently in one downtown stretch adjacent to the bustling but beautiful Manteo waterfront. Many Outer Bank vacationers find Manteo a full and satisfying day trip, however OBX visitors who want to relax and stay a while will find plenty of opportunities to do so. The area features a variety of accommodations, such as motels and hotels, bed and breakfasts, waterfront condos and even vacation rental homes, so any sized party can enjoy a local stay for a day, a week, or even a month. Downtown - Downtown Manteo, located just a few blocks off the main road of US Highway 64, is a destination in its own right, and the small streets that lead to the harbor are filled with gorgeous gardens, manicured lawns, and charming bed and breakfasts. The Pioneer Theater, a fixture in the town for decades, is located along these side streets and claims the honor of being the oldest single-screen and family owned movie theater in America. Unmistakable by its Tudor-style exterior, the theater is open year-round and features a budget-friendly feature as well as a historic theater setting. The waterfront portion of downtown is lined with locally and nationally renowned restaurants, water sports companies, gift shops, antique stores, book stores, galleries, and many more shops and attractions with doors wide open for patrons. 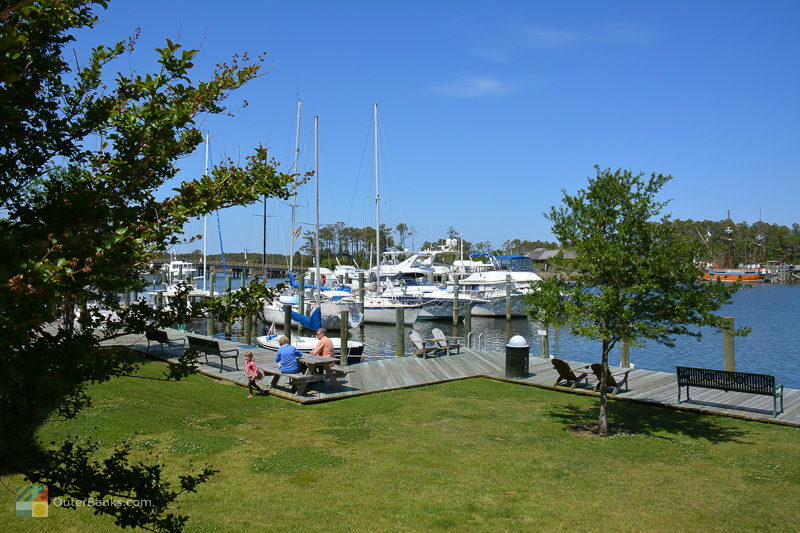 The waterfront is usually stocked full of sailboats, skiffs and yachts of both visiting mariners and year-round locals, as wSell as several local tour companies that allow visitors to hop on board for an afternoon or evening waterfront view of the Outer Banks. Many restaurants have outdoor seating overlooking the harbor, presenting guests with maritime watching at its best, and everyone is encouraged to take a stroll along the waterfront, or simply pull up a bench or a gazebo seat and enjoy the views. Summer visitors should also be on the lookout for seasonal events, including monthly "First Night" celebrations, and Saturday Farmer's Markets that invade the downtown with fresh locally grown produce, homemade goodies, and local arts and crafts. Roanoke Marshes Lighthouse - At the edge of the harbor front lies Roanoke Marshes Light, the Outer Banks' only example of an "in-shore" lighthouse, and a squat but charming one-story backdrop for fantastic Manteo photos. 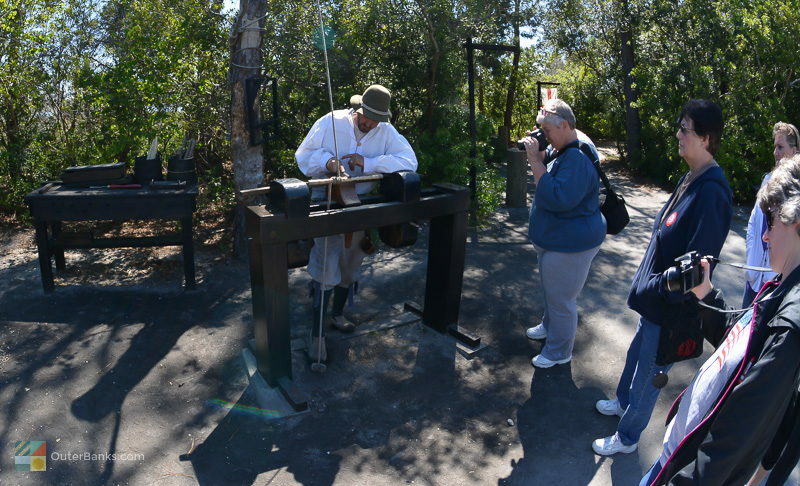 Settler's Village and Native American camp - Visitors can explore the workings of the settler's village with interpretive character demonstrations and blacksmith shop, and a neighboring Native American camp with interactive displays of the lives of Native Americans before English settlers arrived. Elizabeth IIThe elaborately constructed replica of the Elizabeth II, a fantastic and detail-perfect example of the ship that brought the original colonists to Manteo. 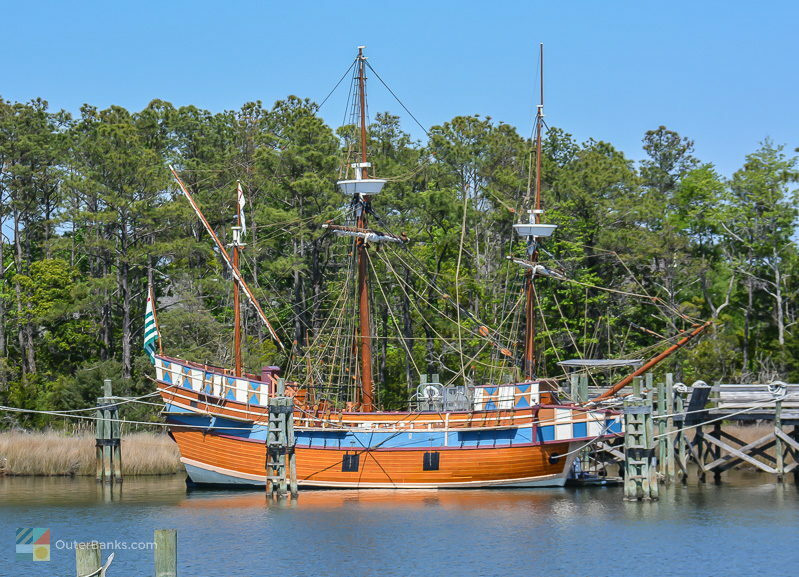 The ship can be explored in person during the prime summer months, guided by costumed interpreters, or can be admired by anyone who strolls along the downtown Manteo docks. Stationed right in the forefront of Manteo's harbor, adjacent to the wooden bridge that leads visitors to the waterfront park, the Elizabeth II is an unmistakable and alluring site to any downtown visitor. 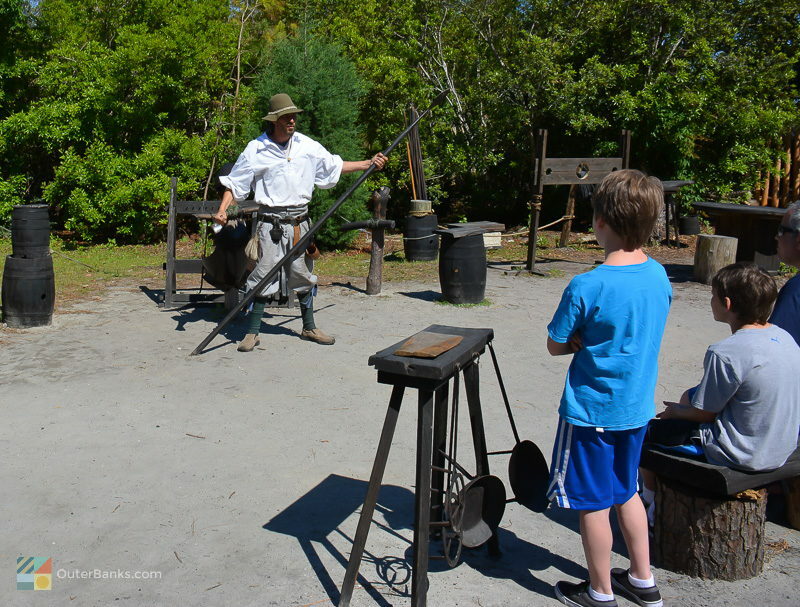 Roanoke Adventure Museum - featuring interactive exhibits and displays that take guests through 400 years of Roanoke Island history. 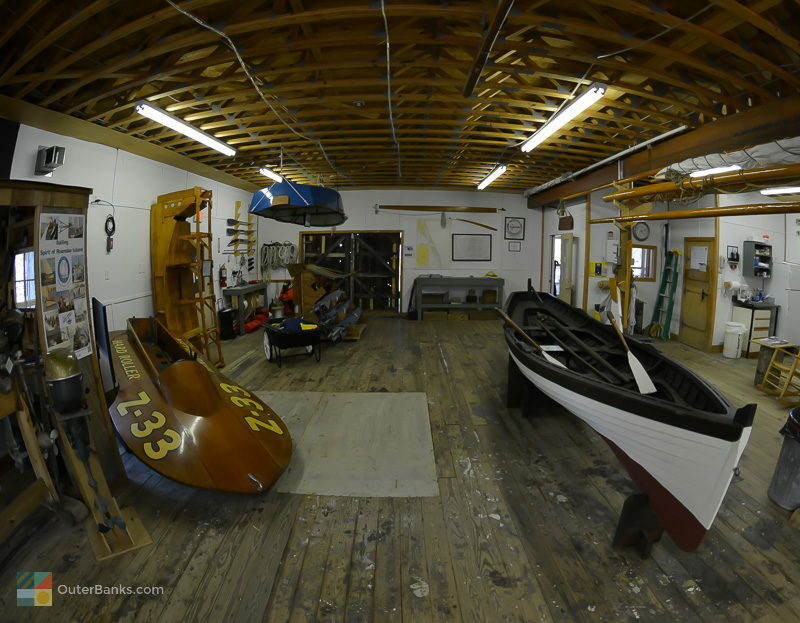 Outer Banks History Center - Visit this library-like treasure trove of Outer Banks information, dating back centuries and serving as an instrumental tool for historians, scientists, journalists, writers, educators, and the everyday public. Researchers and visitors who take a tour through their extensive achieves will be overwhelmed with the raw materials at hand, and it would literally take years to sift through all the documents and accounts available. Pavilion Outdoor Theatre - This outdoor concert and live entertainment venue with Roanoke Sound backdrop is truly stunning. It features a 3,800 sq.ft. stage and lawn-style ampitheatre seating. Check the official schedule for the latest information on upcoming concerts and festivals. N.C. Aquarium on Roanoke Island - Located just a few minutes drive from downtown, the aquarium presents a slice of natural island life, and features exhibits on everything Outer Banks, from the marshy inland habitats to the deep waters of the Gulf Stream. Of course, every exhibit has a healthy sample of the critters that inhabit these areas as well, and guests can expect to see river otters, land and sea turtles, alligators, local and tropical fish, and even a number of different kinds of sharks. The aquarium was designed with kids in mind, and special exhibits and programs are offered year-round to allow the future scientists in your group an opportunity to explore the natural world of the Outer Banks. Open 363 days, visitors can also gently touch stinrays, horseshoe crabs, bamboo sharks, urchins, stars, hermit crabs and more. The N.C. Aquarium is a hugely popular activity, and many families return each year. If rain spoils a beach day, the aquarium is afantastic activity for all ages. Fort Raleigh Visitor Center - Filled with artifacts excavated from the nearby fort, exhibits, historical records, and displays. 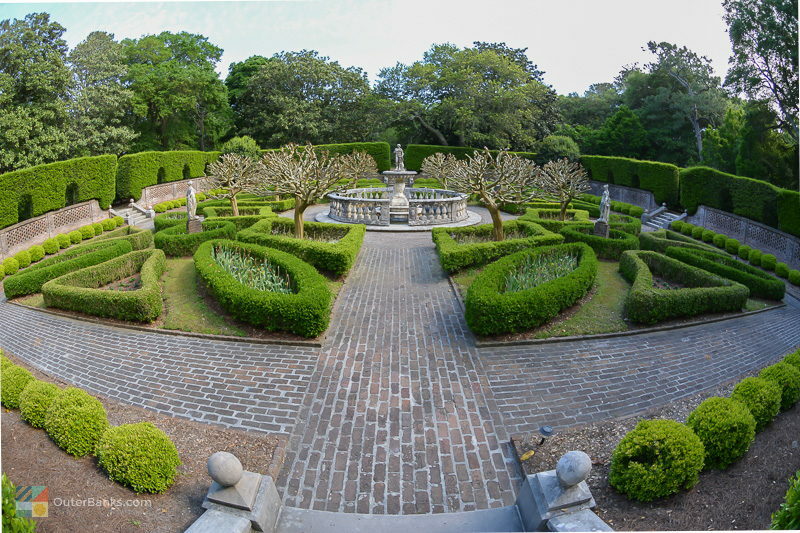 Elizabethan Gardens - A beautiful 10-acre, year-round garden display with sculptures, formal gardens, and native plants. The garden casts a spell over history buffs and nature lovers alike, with acres of perfectly manicured gardens and sculptures, as well as wild-growing native species of plants, flowers and trees. Every season brings a new show-stopper in bloom at the gardens, and visitors who frequent the Outer Banks are encouraged to make multiple visits during different times of year to enjoy the full display. Hydrangeas, Camelias, roses, tulips, and magnolias all make regular appearances, and guests can also marvel at the Elizabethan Era-inspired sculptures, gazebos and garden settings throughout the park. A self-guided walking trail leads visitors in a circular route that borders the Roanoke Soundfront, and a gift store and plant shop are also on the premises for Elizabethan and natural, locally grown souvenirs. 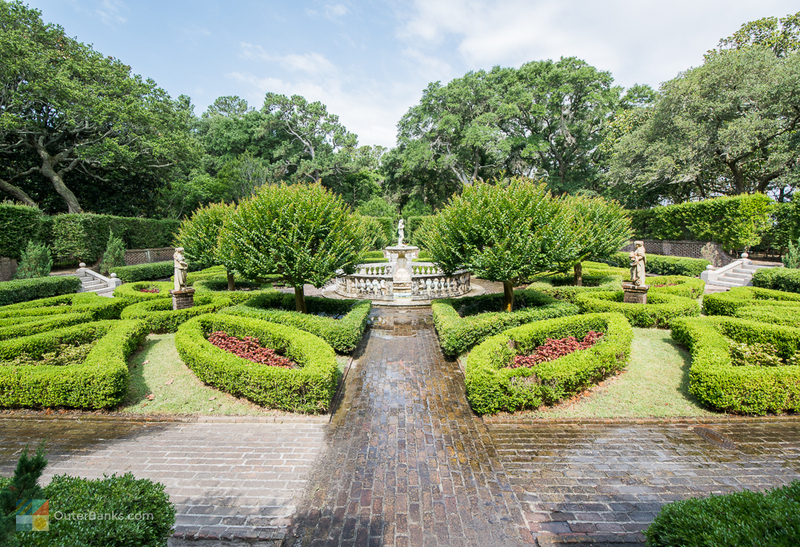 Open year-round, the Elizabethan Gardens is a must-see for anyone who wants to take a natural step back in history, and enjoy the stunning Manteo view. The Lost Colony Outdoor Drama - The longest-running outdoor symphonic drama in America. This is an enormous two hour production, and highly rated by visitors. Over two hundred actors, technicians and volunteers bring the historic "Lost Colony" story to live each Summer. 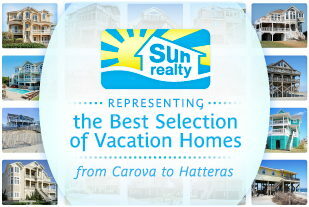 A true gem in the Outer Banks, and fun for the entire family. Dare County Airport - Ever wondered what it would be like to see the Outer Banks from the air? Several air tour companies offer helicopter and open-cockpit biplane rides over your favorite landmarks. Check out the list of air tour companies here. The history of Manteo is storied and deep, beginning with the town name's origin itself. "Manteo" was a chief in the local Roanoke Island community of Native Americans who made a long trip oversees as an ambassador of goodwill to the late 16th Century English explorers. Chief Manteo was, in fact, one of the first American residents to travel to Europe as an honored and distinguished guest. Surprisingly, this is not the most notable footnote of the town's history. Manteo is the home to one of the world's longest running historical mysteries, specifically, the disappearance of the Lost Colony. In 1597, after a series of surface explorations, including one commandeered by Sir Walter Raleigh himself, a new colony was sent to Roanoke Island to settle and begin the English expansion of the New World. Led by John White, the colonists arrived in Manteo and quickly set to building and creating a new settlement. In the process of building a new civilization, John White's own daughter gave birth to the country's first English child, Virginia Dare, for which the Outer Banks home county is named. Months later, however, supplies had run short, and John White had to make a hesitant trip home to England to resupply the camp. Once in Europe, White found himself bogged down by both government inquires and bad weather, and it wasn't until 1590 that he was able to make the long voyage back to Manteo to bring help to his colony, his daughter, and his new granddaughter. Sadly, when he returned, he found the entire colony had been virtually wiped off the map, with only a minor clue to their fate carved into two neighboring trees: the words "Cro" and "Croatan." Many modern historians take this as a sign that the colonists, either as a desperate move to escape starvation or outrun threats from neighboring Native Americans, relocated to the southern beaches of Hatteras Island, where the Croatan Native Americans thrived peacefully. However, after long coastline explorations, John White found no sign of his daughter, grandchild, or any other living soul of that first original Roanoke Island Colony. Today, the drama of the Lost Colony is honored in Manteo with, quite appropriately, an Outdoor Drama. "The Lost Colony" show is the nation's oldest running outdoor drama and features a prestigious cast of former players, including Andy Griffith who starred in the show for several years before becoming a star, and then later returned to the Outer Banks to live out his days as a happy, retired resident. These days, the show is performed nightly in the summertime to sold-out crowds who enjoy the Broadway worthy singing, dancing, acting and pyrotechnics. Reservations are strongly recommended in the prime June, July, and August months as the legendary show, which also features a post-show meet and greet with the cast of characters, tends to sell out fast. The area is also home to the majority of the county's local government offices and services, including the county courthouse, the DMV offices, and the administrative county offices. In addition, vacationers in Manteo will find everything from small grocery stores to pharmacies to bait and tackle shops, for any items they might need during their vacation. For a day trip that's overflowing with the area's most treasured historical attractions, or a relaxing vacation that's off the beaten path, a trip to Manteo should definitely be on the Outer Banks agenda. Vacationers find that after a full day of exploring the shops, sites and attractions, there's still plenty left to see, as well as plenty to love, about this small town with a lot of coastal character. The town of Manteo is located on Roanoke Island, which is sandwiched in between the central Outer Banks beaches and the eastern North Carolina mainland. It is bordered by the Roanoke Sound to the east, and the Croatan Sound to the west. How do you get to Manteo, NC? Visitors from the western part of North Carolina or the Outer Banks can reach Manteo via US 64. What is there to do in Manteo, NC? Manteo has one of the highest concentrations of attractions in the Outer Banks. These popular sites include the North Carolina Aquarium, the Elizabethan Gardens, Fort Raleigh National Historic Site, Roanoke Island Festival Park, the Lost Colony Outdoor Drama, the 1800s Island Farm, the Roanoke Island Marshes Light lighthouse, and the historic downtown area. The town also has a wide array of shops, restaurants, art galleries, historic homes, and other distinctive attractions. Where did the name Manteo come from? “Manteo” is named after a Native American Croatan Chief who greeted and befriended the early English explorers of Roanoke Island in the 1580s. Manteo helped the first colonists survive their initial winter, and even traveled to England in 1584, and again in 1585. How old is Manteo, NC? Manteo is one of the oldest communities in the state of North Carolina, and the country. 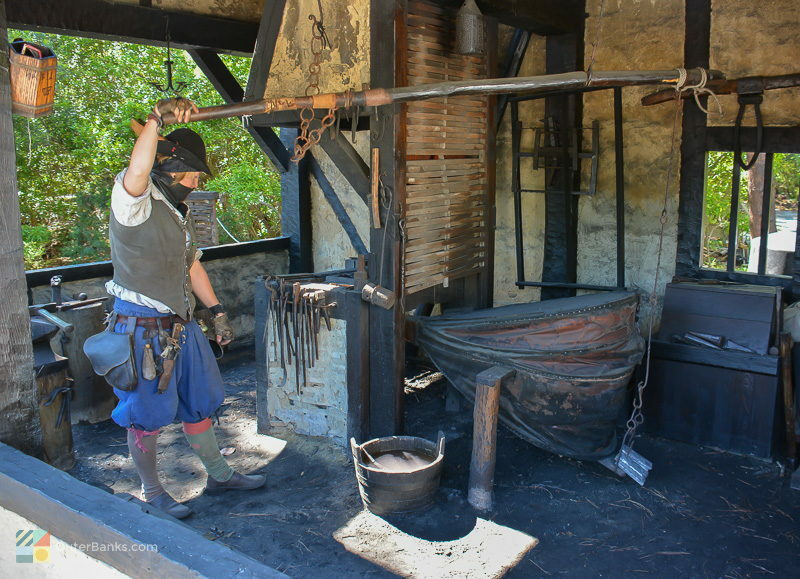 Founded and settled in the 1580s, the area was the site of the first English child born in America, Virginia Dare, as well as one of the first English settlements in the New World. Centuries later, Manteo would be named the seat of government for Dare County in 1870, and the town was officially incorporated in 1899. The Lost Colony was one of the original colonies in the New World, and was settled in 1585 on Roanoke Island. Founded by Sir Walter Raleigh, the colony suffered from tensions with the nearby Native Americans, as well as a lack of food and supplies. As a result, the colony’s governor, Governor White, left the settlers behind in 1587 to sail to England and ask for help. When he returned in August, 1590, all 115 members of the colony had disappeared, and the only clue of their fate was the word "CROATOAN" scratched onto a post, and the letters “CRO” etched into a tree. The fate of the 115 settlers of the 1580s Lost Colony remains a mystery. Some historians believe the colonists tried to sail back to England and did not make it, while others believe that they perished in escalated conflicts with the local Native Americans. Many historians believe that the colonists may have moved south, to Hatteras Island – a theory that was further bolstered by the recent discovery of a 16th century Signet ring in the town of Buxton. What are the special events in Manteo? Manteo has a myriad of special events throughout the year. Favorite annual events include the Bluegrass festival in October, the annual Dare Day Celebration in June, the New World Festival of the Arts in August, and a wide range of holiday-themed celebrations. What are the holiday events in Manteo? Manteo has a line-up of holiday events that last from November through January. These events include the annual Outer Banks Winter Lights display at the Elizabethan Gardens, the annual Christmas Tree Lighting and Holiday Boat Parade in the historic downtown area, and the annual downtown Christmas Parade. What are the summertime events in Manteo? Manteo hosts a weekly summertime farmers’ market on Saturdays in the summer, and the area’s shops and restaurants also have regular special events including live music and outdoor concerts. The Roanoke Island Festival Park features a handful of larger concerts in the summer with nationally recognized performers and bands as well. The town is also famed for its annual Dare Days Festival in June, its New World Festival of the Arts in August, and its 4th of July celebration with fireworks over the downtown waterfront. How close is Manteo to the beach? Manteo is roughly a 10-15 minute drive away from the Outer Banks beaches, depending on traffic. Visitors will find a number of public parking areas in the nearby town of Nags Head, as well as within the Cape Hatteras National Seashore. Downtown Manteo is in the heart of Roanoke Island, and is on the edge of Shallowbag Bay and the Roanoke Sound. Where can you park to explore downtown Manteo? Can you Dock in Downtown Manteo? Downtown Manteo offers town docks for visitors who want to explore the downtown area during a day trip. The town also has a number of local marinas that can accommodate transient mariners. What are the attractions in Manteo, NC? Attractions in Manteo include the Lost Colony Outdoor Drama, Roanoke Island Festival Park, Fort Raleigh National Historic Site, the Elizabethan Gardens, the North Carolina Aquarium on Roanoke Island, the 1800s Island Farm, Roanoke Marshes lighthouse, and the historic Downtown area. The town is also known for its charming collection of shops, boutiques, art galleries, antique stores, and restaurants along the downtown waterfront. Are there shops and restaurants in Manteo, NC? Manteo has a wide variety of popular shops and restaurants, especially in the historic downtown area. The town is known for its gift shops, antique stores, art galleries, and other specialty shops and eateries along the waterfront. Where do you stay in Manteo, NC? Manteo has a number of smaller hotels and motels, as well as a collection of historic bed and breakfasts. There are also a number of vacation rental homes or condos in Manteo. What can you do on a rainy day in Manteo, NC? 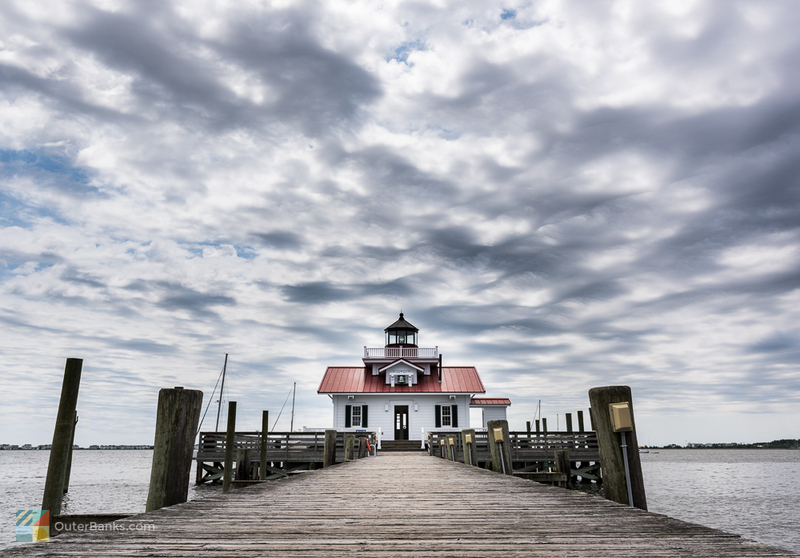 Manteo has a wide array of attractions for rainy days, like the North Carolina Aquarium on Roanoke Island, the historic 1918 Pioneer Movie Theater, and the Roanoke Maritime Museum. In addition, the town has a wonderful variety of charming shops, galleries, and restaurants. 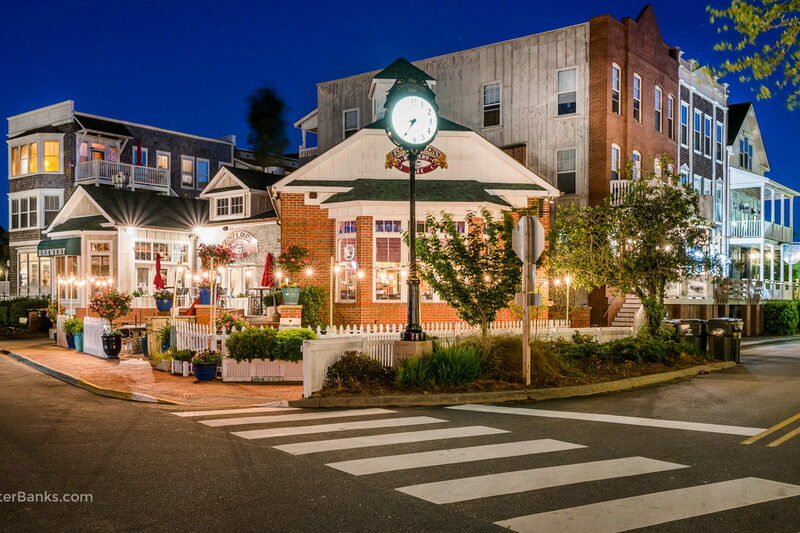 Manteo is unique on the Outer Banks as it is popular with visitors all year long. The town is especially enticing during the holidays, when the area hosts a number of events, and in the summertime when Outer Banks vacationers make a day trip to explore Roanoke Island’s many attractions. What are the air temperatures each month in Manteo?